Finding Penelope's climactic "chorus" scene. Photo courtesy of 371 Productions. In the Fall of 2010 an unlikely group of actors set to work transforming Luther Manor Senior Living Community in Wauwatosa into an interactive venue for live theatre. Familiar facility settings—resident rooms, the dining hall, the sanctuary—became part of a living stage upon which a cast of UW–Milwaukee students, professional actors from Portland-based Sojourn Theatre, and Luther Manor residents joined together to re-imagine Homer’s Odyssey. Focusing on Odysseus’s wife and her refutation of 108 suitors during her husband’s absence, their original play, called Finding Penelope, debuted on March 15th, 2011. For playwright Anne Basting, Finding Penelope represented a community-based effort to create “activities in long-term care [that are] more meaningful.” An author, director of the University of Wisconsin–Milwaukee Center on Age & Community, and founder of Timeslips Creative Storytelling, Bastings has devoted her career to helping those living with dementia and Alzheimer’s disease. She has found that by fostering a safe environment for storytelling and theatrical improvisation one can “replace the pressure to remember with the freedom to imagine.” Her Penelope Project seeks to create impactful moments and connections through “open-ended creative storytelling,” which provides the backbone for the project’s engaging, and often challenging, activities that incorporate poetry, movement, and visual art. The performances of Finding Penelope sold out, brought many audience members to tears, and drew rave reviews from its professional and resident actors alike. And, in many ways, the living stage they created became a living community. 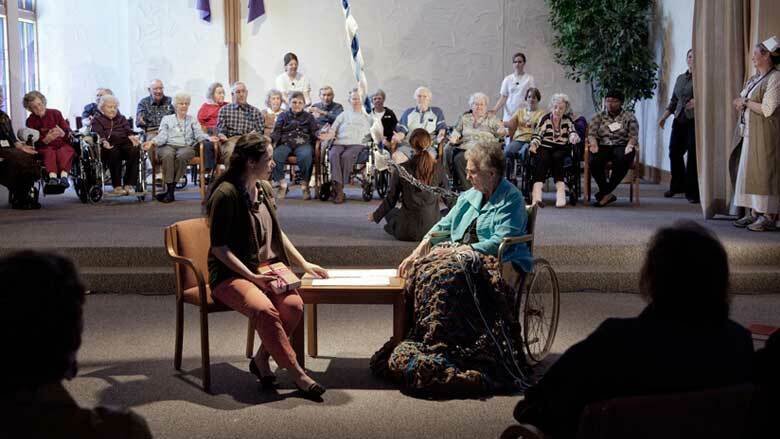 New relationships were forged between the UWM theatre students and Luther Manor residents and staff, setting a positive example for intergenerational exchange that is hard to come by in a youth-driven culture that marginalizes seniors. Basting is currently at work furthering this idea of creating a more connected community through a new project called Islands of Milwaukee, which addresses the social isolation that grips many homebound seniors and other community members. “When we finished Penelope, we really felt like we had succeeded in building community. But then we thought: Most older adults don’t live in care homes. 85% live in their own homes, and more than ever before, they are living alone.” Islands of Milwaukee will culminate as interactive performances on September 20th and 21st at Milwaukee City Hall, with an attendant exhibit running through October. The Penelope Project and other endeavors like it set an example that other care homes can follow. Given the site-specific nature of Finding Penelope, program directors decided that their play would be “impossible to replicate exactly” but instead hope to share their approach and framework. Basting notes that several projects inspired by Finding Penelope have since been staged, including a musical in a Madison care community. A spectrum of educational tools and training options available on both the Penelope Project and Timeslips websites allow for other care homes to use these materials as guidepost for their own adaptations. Aiding in the effort to share these materials is 371 Productions’ Penelope: The Documentary, which follows the entire arc of Finding Penelope from its planning stages to its Luther Manor performances. The documentary supplements the other Penelope Project materials, conveying the emotional weight and joy experienced by resident-actors. By capturing the immediate, momentary connections and sharing them with a much larger audience, the documentary celebrates the achievement of the original performances and shares them with others—which is very much in the spirit of the Penelope Project as a whole. Penelope: The Documentary was featured on Wisconsin Public Television’s Director’s Cut program this past June, and can be seen airing at film festivals and screenings both in Wisconsin and nationwide.